1. Preheat the oven to 200°C, gas mark 6. Bring the vegetable stock to the boil in a large, wide saucepan. Add the leeks and simmer for 10-12 minutes until tender when tested with the tip of a sharp knife. Drain well, reserving 100ml of the stock. 2. Wrap each leek in a slice of ham and place in a shallow ovenproof dish. Mix together the mustard with the crème fraîche, most of the cheese and the reserved 100ml vegetable stock. 3. 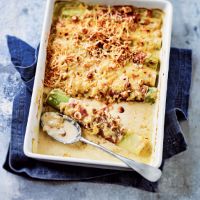 Pour the mixture over the leeks and then sprinkle on the breadcrumbs, remaining cheese and finally the hazelnuts on top. Bake for 15-20 minutes until bubbling and golden.